A King and no King. Francis Beamount, and Iohn Flecher. Acted at the Globe, by his Maiesties Seruants. AT LONDON Printed for Thomas Walkley, and are to bee sold at his shoppe at the Eagle and Childe in Brittans-Bursse. 1619. 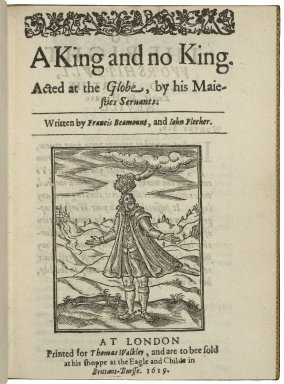 Title page imaged from Folger call number: STC 1670. Image is not from the transcribed copy.